The long-awaited official opening of the new Longchamp, rebranded in the best marketing sense as ParisLongchamp to remind Parisians that the world's most elegant racecourse is, indeed, just a few miles from the center of the French capital, went off with only a few hitches on Sunday afternoon as local racegoers and invited guests braved temperatures in the mid-40s while attempting to adapt to an ultra-modern grandstand that is quite unlike any other in the world. Although the first meeting at the home of the Prix de l'Arc de Triomphe was held three weeks ago on April 8, and three other meetings have been run since that day, Sunday's gala event attracted the crème de la creme of the French racing and business worlds, and make no mistake, this reconfigured grandstand is intended to attract business interests on days when there is no racing at Longchamp just as much as it is hoped to attract racing fans old and new. Closed since Oct. 5, 2015, when Golden Horn won the Arc de Triomphe, the new stand was designed by Dominique Perrault, an architect previously responsible for buildings as varied as the Bibliotheque National de France (National Library of France) in Paris, the Velodrome and Olympic Swimming Pool in Berlin, Germany, and the Fukoko Tower in Osaka, Japan. He has colored the outer shell of the new plant entirely ochre, a shading that might be described as a light burnt orange, on this overcast day at least. Billed as “an environmentally responsible racecourse,” the new ParisLongchamp boasts 105 newly planted trees, 55,000 square meters of grass area (35,000 square meters more than before), plus buildings heated a full 100 percent by geothermal energy, something that will surely thrill geothermal energy enthusiasts around the world. The track apron, formerly macadam, is now a lush and green lawn, an attractive space that will require careful footing on rainy days. There are, however, far fewer seats available for the “turfistes,” that is, the typical racegoers who pay the minimum 5-euro (six-dollar) admission on weekdays, or 8 euros (10 dollars) on Sundays. Instead of seats they are invited to sit on graded terraces on the ground level, while the members' enclosures on the second, third and fourth floors are provided with real seats with backs and arm rests. The new paddock, slightly smaller than the old one, has reduced its terraced standing capacity by half, the new terraced viewing stands for non-members facing just one-third of the walking ring. Much of the reduction in amenities for the typical racegoer at ParisLongchamp stems from the simple fact that very few people pay their way into Parisian racetracks these days, save on Arc Weekend in early October. 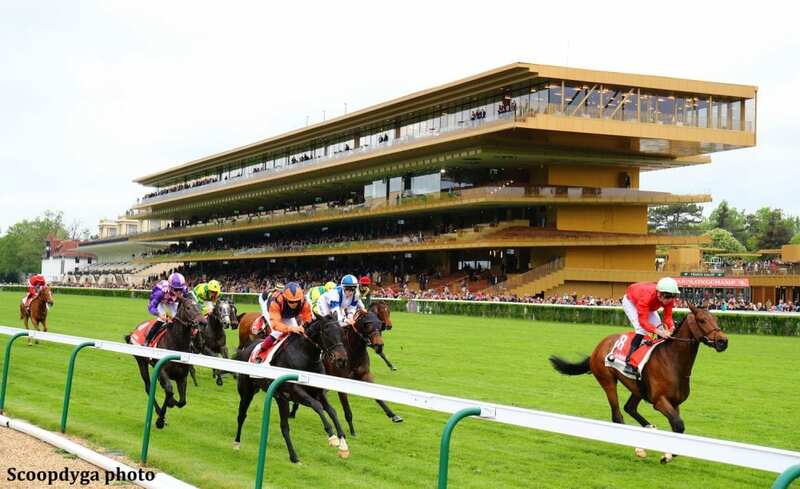 It has been the stated intention of France Galop, which operates French racing, that the new grandstand will be a beacon for concerts, business meetings and social gatherings as well as horse races. Officials boast the facility can handle any occasion for between 500 and 60,000 people for seminars and congresses of every stripe. To that end Longchamp's 34 days of racing this year are only one part of the overall program. It is hoped that the concerts that will follow racing on Sundays and Thursday evening meetings will attract a new and younger racing fan, while business interests will be lured by the racecourse's proximity to the Parisian business district, La Defense, two miles north of the track. Upon entering Longchamp's Grille d'Honneur, or main gate, one is greeted by a broad, functional concrete staircase at the top of which stands the hallowed statue of Gladiateur, the first French-bred to win the Epsom Derby. France Galop members are then ushered up to swank dining areas like the Restaurant Panoramique, and the Salon de Goldikova, named for the three-time winner of the Breeders' Cup Mile. The typical racing fan is directed to an area beyond the finish line where there are food trucks offering an assortment of sandwiches, hot dogs, frites and beverages, alcoholic and otherwise. Also available for family entertainment is a carousel, pony rides and games like croquet geared toward youngsters who accompany mom and dad to the track. Their view of the races is limited, however, as they are situated beyond the grandstand and have just a ground level view of the thoroughbred action. They are also a quarter of a mile from the paddock. If they have difficulty seeing a race live, there are 500 television screens available throughout the grounds. There are also 150 betting terminals for wagering, but the majority of those are machines that do not dispense cash. If you have a winner, you must find one of the human pari-mutuel clerks to cash your ticket. This is not the most convenient of situations. It is, however, a fact of modern life at contemporary racetracks. Longchamp first opened its doors on April 27, 1857, with Emperor Napoleon III, the nephew of Napoleon Bonaparte, present, on the grounds of what had once been a medieval abbey. A new grandstand was erected in 1870 shortly after the disastrous (for France) Franco-Prussian War. A third stand was built in 1904, of which one listed building still stands at the head of the stretch. The other three stands from that era were torn down in 1964 and replaced with the structure that preceded this new improved ParisLongchamp. 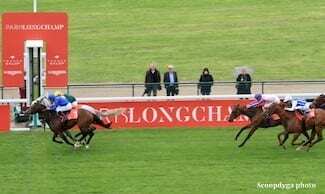 In a front page story in Paris-Turf, the French racing daily, on Sunday, France Galop president Edouard de Rothschild waxed poetic about the new Longchamp's potential. “The French equine family is raised in tradition and passion. It is a sporting community stretching across all disciplines written into our profound patrimony. The new racecourse is a window of the exceptional French lifestyle admired the world over.” And the world certainly must admire the performance of Cracksman in winning ParisLongchamp's first Group 1 race Sunday, the Prix Ganay, for his British trainer and owner John Gosden and Anthony Oppenheimer, and his Italian rider, Frankie Dettori. Fifty yards into the 2 ½-furlong stretch, the inner rail suddenly drops away providing a broad path for horses along the rail to fan out on the inside in a way similar to that which horses fan out on the wide outside. The hope is that this will prevent horses from getting stuck on the rail. It may, however, give inside horses, who have always had the advantage of saving ground, an additional advantage over wide horses. Early results, on the other hand, have not proved conclusive. At day's end virtually everyone in the upper reaches of the grandstand was pleased with the new facility, including the color scheme. Down below on ground level, families were enjoying themselves in spite of the inclement weather. And hardly had the horses in the last of eight races crossed the finish line than French DJ The Avenir (whose name means, appropriately enough, The Future) was gearing up his chest thumping rhythms intended to keep the younger generation happy and dancing long after the betting windows have closed. O Brave New World, where is horse racing headed? Alan Shuback is author of the forthcoming book “Hollywood at the Races,” to be published by the University Press of Kentucky in early 2019. 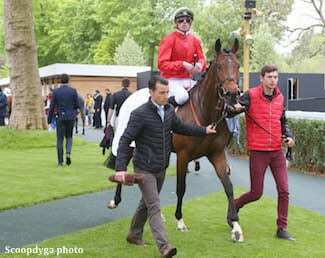 This entry was posted in NL Article, Ray's Paddock and tagged Alan Shuback, Anne Hidalgo, Dominique Perrault, Edouard de Rothschild, France Galop, French racing, longchamp, Paris-Turf, ParisLongchamp, Stephane Travert by Alan Shuback. Bookmark the permalink.